Movie and television production incentives are tax benefits offered by various regions in the U.S. and abroad to encourage film/TV production in that region. These incentives came about in the U.S. in the 1990s in response to the flight of movie productions to countries such as Canada. Today they are offered around the world, including several states in the U.S. such as California, New York, Louisiana, New Mexico, Virginia, Georgia and Ohio; and abroad including Canada, Australia, and the U.K.
Tax credits — whether they’re in California or any other state, or abroad — have become part and parcel of independent film financing. Financiers of a film or television project will look to maximize tax credits where they can in order to subsidize the production budget. Tax credits are an integral part of independent film financing – they could be 10, 20, 30% of the budget, or a few hundred thousand dollars. Runaway production/post-production describes filmmaking and television productions that are intended for initial release/exhibition or television broadcast in the U.S., but are actually filmed in another country. On a local scale, in Los Angeles the term has come to mean the exodus of jobs relating to the film/TV industry that were typically done in Hollywood or elsewhere in the state but were lured to other regions by more enticing tax credit programs. Since California created its own Film and Television Tax Credit Program in 2009, it has proven to be one of the state’s most efficient and proven economic development tools, generating more than 50,000 jobs and $4.7 billion in direct spending as of 2013. The program recently received a significant boost with AB 1839 – which upped the program to $300 million annually as well as offering additional incentives including a 5% bump to the existing 25% provision for music scoring done in the state. With that said, the current incentive program is not meeting its full potential, particularly as it relates to post-production including music scoring. While the current program does include an added bonus of 25% for post-production work done in-state, it does not make doing this work in California a requirement, and productions still receive significant credits even if all post-production is done out of state. It is imperative that we take decisive steps NOW to ensure production companies that benefit from the state’s $300-million annual tax credit program are made accountable to hold professional musicians to the same industry standard as actors, writers, grips, carpenters, drivers and other industry workers. Why do musicians want to amend the CA Film & TV Tax Credit Program? production and post-production. The Film & Television Tax Credit Program is a significant factor in bringing more of this work to the state, but continued improvements are needed to ensure the fair treatment of the professional musicians who rely on jobs creating the soundtracks to motion pictures and TV shows as their primary way to earn a living. What would AB 1199 change relating to music scoring in CA? AB 1199 introduces language that would for the first time create a new system for supporting musician jobs in California. Musicians are optimistic about further developments in improving California’s existing tax credit program to bring about more music scoring work in the state. 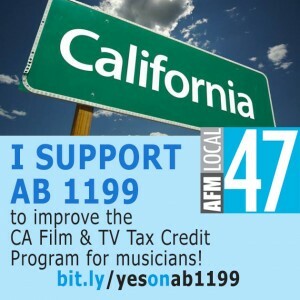 Sign our petition to support AB 1199 and make continued improvements to CA’s Film/TV Tax Credit Program for musicians!